MBC Financial Services Ltd "MBCFX" Risk Disclosure Statement for Currency Spot Markets This brief statement does not disclose all of the risks and other significant aspects of trading foreign exchange spot contracts, hereinafter referred to collectively as foreign exchange contracts. In light of the these risks, the Trader should undertake such transactions only if Trader understands the nature of the contracts (and contractual relationships) into which Trader is entering, and the extent of the Trader’s exposure to risk. Trading in foreign exchange contracts is not suitable for many members of the public. Trader should carefully consider whether trading is appropriate for Trader in light of Trader’s experience, objectives, financial resources, age, and relevant circumstances. Currency Spot Market 1. Effect of Leverage or Gearing. Transactions in foreign exchange contracts carry a high degree of risk. The amount of initial margin is small relative to the value of the foreign exchange contract, so that transactions are leveraged. Leverage is the ability to control large dollar amounts of a foreign currency with a comparatively small amount of capital. A relatively small market movement will have a proportionately larger impact on the funds the Trader has deposited or will have to deposit; this may work against the Trader as well as for Trader. For an example, an account with MBC FINANCIAL SERVICES LTD permits you to trade foreign exchange contracts on a highly leveraged basis (up to approximately 100 times your account equity). An initial deposit of $1,000 will enable the account holder to take maximum positions with $100,000.00 market value. The funds in an account trading at maximum leverage can be completely lost if the positions held in the account has a one percent adverse swing in the market. 2. Risk-reducing orders or strategies The placing of certain orders (e.g. stop-loss orders, or stop-limit orders), which are intended to limit losses to certain amounts, may not be effective because market conditions may make it impossible to execute such orders. In addition, Trader must be aware that trading in spread or straddle positions may not be less risky than, and that these positions carry certain complexities not found in, a simple long or short position. Therefore Trader should consider whether using these trading strategies is consistent with Trader’s objectives and goals in trading the foreign exchange contract markets. A spread or straddle trade is the simultaneous buying and selling of two related markets in the expectation that a profit will be made when the position is offset. 4. Deposited cash and property Trader should familiarize himself/herself with the protections accorded money or other property they deposited for domestic and foreign transactions, particularly in the event of a firm insolvency or bankruptcy. The extent to which the Trader may recover Trader’s money or property may be governed by specific legislation or local rules. In some jurisdictions, property which had been specifically identifiable as the Trader’s will be pro-rated in the same manner as cash for purposes of distribution in the event of a shortfall. 5. Commissions and other charges Before the Trader begins to trade, Trader should obtain a clear explanation of all commissions, fees and other charges for which Trader will be liable. These charges will affect the Trader’s net profit (if any), or increase Trader’s loss. MBC FINANCIAL SERVICES LTD Spread Disclosure: Each transaction for Trader’s account includes a spread between the bid and the ask prices for any foreign exchange contract. The spread in the dealing rates is a cost imposed by MBC FINANCIAL SERVICES LTD on all trades for making foreign exchange contract transactions. The spread may increase or decrease based on the sole determination of MBC FINANCIAL SERVICES LTD. Trader should consider the spread because it can affect the profitability of Trader’s transactions or increase Trader’s loss. The spread may not be the same for each foreign currency offered by MBC FINANCIAL SERVICES LTD or for each strike price within the individual foreign currency. MBC FINANCIAL SERVICES LTD Commission Disclosure: Each transaction for the Trader’s account incurs a Transaction Fee of $1.25 per 10,000 base currency unit, charged to the account upon opening a position. 6. Electronic Trading Trading on an electronic trading system with MBC FINANCIAL SERVICES LTD may differ not only from trading in the inter-bank market but also from trading on any other electronic trading systems and will subject Trader to the failure of the electronic trading system of MBC FINANCIAL SERVICES LTD, including, but not limited to, the failure of hardware and software. The result of any system failure may be that Trader’s order is either not executed according to Trader’s instructions or is not executed at all. Since MBC FINANCIAL SERVICES LTD does not control signal power, its reception or routing via Internet, configuration of Trader’s equipment or reliability of its connection, MBC FINANCIAL SERVICES LTD shall not be responsible for communication failures, distortions or delays when trading on-line (via Internet). 7. Additional disclosures and notices to traders In connection with opening an account to speculate and/or purchase and/or sell foreign exchange contracts with MBC FINANCIAL SERVICES LTD. Trader acknowledges that Trader has been advised and understands the following factors concerning trading in leveraged foreign exchange contracts. A. Foreign exchange contracts are not traded on a regulated exchange. MBC FINANCIAL SERVICES LTD acts as the counter-party to all of Trader’s foreign exchange contract transactions. There are no guarantees to the credit worthiness of MBC FINANCIAL SERVICES LTD. MBC FINANCIAL SERVICES LTD establishes prices for all foreign exchange contracts on the trading platform and the prices established may not reflect actual market values. MBC FINANCIAL SERVICES LTD has the right, in its sole discretion, to cease trading in any foreign exchange contract at any time, and in such event Trader will be prevented from liquidation of an adverse position. Such actions could result in a substantial loss to Trader. For these reasons, when entering into foreign exchange contracts there may be certain cases in which trading liquidity decreases causing trading in a certain Currency to cease, thereby preventing the liquidation of an adverse position that may result in a substantial financial loss. For this reason, these transactions may involve increased risks over trading in exchange traded contracts. Spot currency market transactions may be less regulated, or subject to a separate regulatory regime. Before the Trader undertakes such transactions, they should familiarize themselves with all attendant risks. B. Trading in foreign exchange contracts is suitable only for those sophisticated individuals or institutions who fully understand all substantial risks involved and can withstand a loss of all monies, margins or deposits made with MBC FINANCIAL SERVICES LTD If Trader is not a sophisticated investor who does not fully understand this Risk Disclosure statement and Trader Agreement and is not capable of sustaining a loss of all monies invested, Trader should not proceed. C. Trader acknowledges that the purchase or sale of foreign currency contracts always anticipates the accepting or making of delivery. D. MBC FINANCIAL SERVICES LTD’s margin policies require that your account be properly margined at all times. In order to do so, it may be necessary to deposit substantial additional funds. Failure to meet margin requirements may result in the liquidation of any open positions with a resultant loss. MBC FINANCIAL SERVICES LTD reserves the right to liquidate all positions, without notice or margin call, if an account falls below our minimum equity level. E. Foreign exchange contract transactions made by Trader with MBC FINANCIAL SERVICES LTD are not traded on a regulated exchange and therefore do not require open-outcry. Open-outcry is a method of public auction for making bids and offers in the trading pits of futures exchanges. Even though quotations or prices are afforded by many computer-based component systems, the quotations and prices offered by MBC FINANCIAL SERVICES LTD may vary due to market liquidity and due to decisions at the sole discretion of MBC FINANCIAL SERVICES LTD F. Trading on an electronic trading system with MBC FINANCIAL SERVICES LTD may differ not only from trading in the inter-bank market but also from trading on any other electronic trading systems and will subject Trader to the failure of the electronic trading system of MBC FINANCIAL SERVICES LTD, including, but not limited to, the failure of hardware and software. The result of any system failure may be that Trader’s order is either not executed according to Trader’s instructions or is not executed at all. (Stated in paragraph 6 above) The following additional risks exist when trading with MBC FINANCIAL SERVICES LTD: i) Internet failures: Since MBC FINANCIAL SERVICES LTD does not control signal power, its reception or routing via Internet, configuration of Trader’s equipment or reliability of its connection, MBC FINANCIAL SERVICES LTD cannot be responsible for communication failures, distortions or delays when trading on-line (via Internet). (Stated in paragraph 6 above) ii) Market risks and on-line trading: Trading foreign exchange contracts involves substantial risk that is not suitable for everyone. Trading on-line with MBC FINANCIAL SERVICES LTD, no matter how convenient or efficient, does not reduce the substantial risks associated with foreign exchange contract trading. iii) Password protection: The Trader is obligated to keep passwords secret and ensure that third parties do not obtain access to the trading facilities. The Trader will be liable to MBC FINANCIAL SERVICES LTD for trades executed by means of the Trader’s password even if such use may be wrongful. iv) Quoting errors: An erroneous price quote to a Trader may occur as a result of failure of hardware, software or communication lines or systems and/or inaccurate external data feeds provided by third-party vendors. MBC FINANCIAL SERVICES LTD will not be liable for any erroneous price quote to Trader, mistakes or negligence. The foregoing list is not meant to be exhaustive and in the event of an erroneous price quote to Trader, MBC FINANCIAL SERVICES LTD reserves the right to make the necessary corrections or adjustments for an erroneous price quote on the account involved. Any dispute will be resolved based on the fair market value of the foreign exchange contract at the time such error occurred. G. MBC FINANCIAL SERVICES LTD will be acting as the counter party to all foreign exchange contract transactions made by Trader. As a result, it may be difficult or impossible for Trader to liquidate an existing position, to assess the value, to determine a fair price or to assess the exposure to risk. For these reasons, foreign exchange contract transactions involve increased risks. Foreign exchange contract transactions, with MBC FINANCIAL SERVICES LTD, are not regulated or subject to a separate regulatory regime, as are exchange-traded contracts. Before Trader undertakes such transactions, Trader should familiarize himself/herself with applicable rules and attendant risks to entering into foreign exchange contracts with MBC FINANCIAL SERVICES LTD H. In the event that Trader grants trading authority or control over Trader’s account to a third party (Trading Agent), whether on a discretionary or non-discretionary basis, MBC FINANCIAL SERVICES LTD shall in no way be responsible for reviewing Trader’s choice of such Trading Agent or for making any recommendations with respect thereto. MBC FINANCIAL SERVICES LTD makes no representations or warranties concerning any Trading Agent; MBC FINANCIAL SERVICES LTD shall not be responsible for any loss to Trader occasioned by the actions of the Trading Agent; and MBC FINANCIAL SERVICES LTD does not, by implication or otherwise, endorses or approve of the operating methods of the Trading Agent. If Trader gives the Trading Agent authority to exercise any of its rights over its account, Trader does so at his risk. 8. TRADER’S ACCOUNT MAY BE INTRODUCED TO MBC FINANCIAL SERVICES LTD, BY AN INTRODUCING BROKER. (REFERRED TO AS INTRODUCER) INTRODUCER MAY OR MAY NOT BE REGISTERED IN ANY CAPACITY WITH ANY REGULATORY BODY. MBC FINANCIAL SERVICES LTD ASSUMES NO LIABILITY FOR ANY REP RESENTATIONS MADE BY INTRODUCER. MBC FINANCIAL SERVICES LTD AND INTRODUCER ARE WHOLLY SEPARATE AND INDEPENDENT FROM ONE ANOTHER. THE AGREEMENT BETWEEN MBC FINANCIAL SERVICES LTDAND INTRODUCER DOES NOT ESTABLISH A JOINT VENTURE OR PARTNERSHIP AND INTRODUCER IS NOT AN AGENT OR EMPLOYEE OF MBC FINANCIAL SERVICES LTDFOREIGN EXCHANGE CONTRACT TRADING INVOLVES SUBSTANTIAL RISK. NO ONE SHOULD CONSIDER ENGAGING IN FOREIGN EXCHANGE CONTRACT TRADING WHO IS NOT, EITHER ALONE OR TOGETHER WITH SUCH PERSON.S FINANCIAL ADVISERS, FINANCIALLY SOPHISTICATED AND CAPABLE OF EVALUATING THE MERITS AND RISKS OF FOREIGN EXCHANGE CONRACT TRADING AND CAPABLE OF SUSTAINING A FULL LOSS OF ALL MONIES INVESTED. TRADER AGREEMENT This is a legal contract between MBC FINANCIAL SERVICES LTD, (hereinafter referred to as MBC FINANCIAL SERVICES LTD), a BVI corporation organized under the laws of the BVI, its successors and assigns, and the party (or parties) executing this document. All the defined terms used herein shall have the meanings ascribed in the MBC FINANCIAL SERVICES LTD Risk Disclosure Statement and in the Glossary of Terms. In consideration of MBC FINANCIAL SERVICES LTD agreeing to carry one or more accounts of the undersigned (Trader) and providing services to Trader in connection with the purchase and sale of foreign exchange contracts, which may be purchased or sold by or through MBC FINANCIAL SERVICES LTD for Trader’s accounts(s), Trader agrees as follows: 1. AUTHORIZATION TO TRADE. MBC FINANCIAL SERVICES LTD will engage in foreign exchange contracts transactions with Trader in accordance with Trader’s oral, written or electronic instructions. MBC FINANCIAL SERVICES LTD will act as the counter-party to the Trader in all such transactions. Each foreign exchange contract entered into between the Trader and MBC FINANCIAL SERVICES LTD on the date of or after this Agreement is executed shall be governed by this Agreement. 2. GOVERNMENTAL, COUNTER PARTY INSTITUTION AND INTERBANKING SYSTEM RULES. All transactions under this Agreement shall be subject to the constitution, by-laws, rules, regulations, customs, usage, rulings and interpretations of the counter party institution or other interbank market (and its clearing organization, if any) where executed and to all applicable laws and regulations. If any statute shall hereafter be enacted or any rule or regulation shall hereafter be adopted by any governmental authority, or a contract market or clearing organization which shall be binding upon MBCFX and shall affect in any manner or be inconsistent with any of the provisions hereof, the affected provisions of this Agreement shall be deemed modified or superseded, as the case may be by the applicable provisions of such statute, rule or regulation, and all other provisions of this Agreement and provisions so modified shall in all respects continue in full force and effect. Trader acknowledges that all transactions under this Agreement are subject to the aforementioned regulatory requirements and Trader shall not thereby be given any independent legal or contractual rights with respect to such requirements. 3. MARGINS AND DEPOSIT REQUIREMENTS. Trader shall provide to and maintain with MBC FINANCIAL SERVICES LTD margin, which is the minimum value on deposit in your account to establish a new foreign exchange contract position, or to add to an existing position, in such amounts and in such forms as MBC FINANCIAL SERVICES LTD, in its sole discretion, may require. Margin amount levels may differ by contract, and MBC FINANCIAL SERVICES LTD may change margin requirements at any time. In the event Trader’s account contains insufficient margin at any time, MBC FINANCIAL SERVICES LTD may at any time proceed to liquidate Trader’s account and any failure by MBC FINANCIAL SERVICES LTD to enforce its rights hereunder shall not be deemed a waiver by MBC FINANCIAL SERVICES LTD to enforce its rights thereafter. No previous margin requirement by MBC FINANCIAL SERVICES LTD shall preclude MBC FINANCIAL SERVICES LTD from increasing that requirement without prior notice. MBC FINANCIAL SERVICES LTD retains the right to limit the amount and/or total number of open positions that Trader may acquire or maintain at MBC FINANCIAL SERVICES LTDMBC FINANCIAL SERVICES LTD reserves the right to refuse to accept any order. MBC FINANCIAL SERVICES LTD shall not be responsible for any loss or damage caused, directly or indirectly, by any events, actions or omissions beyond the control of MBC FINANCIAL SERVICES LTD including, without limitation, loss or damage resulting, directly or indirectly, from any delays or inaccuracies in the transmission of orders and/or information due to a breakdown in or failure of any transmission or communication facilities. 4. COLLATERAL AND LENDING AGREEMENT. All funds, securities, currencies, and other property of Trader which MBC FINANCIAL SERVICES LTD or its affiliates may at any time be carrying for Trader (either individually, jointly with another, or as a guarantor of the account of any other person) or which may at any time be in its possession or control or carried on its books for any purpose, including safekeeping, are to be held by MBC FINANCIAL SERVICES LTD as security and subject to a general lien and right of set-off for liabilities of Trader to MBC FINANCIAL SERVICES LTD whether or not MBC FINANCIAL SERVICES LTD has made advances in connection with such securities, commodities, currencies or other property, and irrespective of the number of accounts Trader may have with MBC FINANCIAL SERVICES LTD. MBC FINANCIAL SERVICES LTD may in its discretion, at any time and from time to time, without notice to Trader, apply and/or transfer any or all funds or other property of Trader between any of Trader’s accounts. Trader hereby also grants to MBC FINANCIAL SERVICES LTD the right to pledge, re-pledge, hypothecate, invest or loan, either separately or with the property of other Traders, to itself as broker or to others, any securities or other property of Trader held by MBC FINANCIAL SERVICES LTD as margin or security. MBC FINANCIAL SERVICES LTD shall at no time be required to deliver to Trader the identical property delivered to or purchased by MBC FINANCIAL SERVICES LTD for any account of Trader. 5. LIQUIDATION OF ACCOUNTS AND PAYMENT OF DEFICIT BALANCES. In the event of (a) the death or judicial declaration of incompetence of Trader; (b) the filing of a petition in bankruptcy, or a petition for the appointment of a receiver, or the institution of any insolvency or similar proceeding by or against Trader; (c) the filing of an attachment against any of Trader’s accounts carried by MBC FINANCIAL SERVICES LTD, (d) insufficient margin, or MBC FINANCIAL SERVICES LTD’s determination that any collateral deposited to protect one or more accounts of Trader is inadequate, regardless of current market quotations, to secure the account; (e) Trader’s failure to provide MBC FINANCIAL SERVICES LTD any information requested pursuant to this agreement; or (f) any other circumstances or developments that MBC FINANCIAL SERVICES LTD deems appropriate for its protection, and in MBC FINANCIAL SERVICES LTD’s sole discretion, it may take one or more, or any portion of, the following actions: (1) satisfy any obligation Trader may have to MBC FINANCIAL SERVICES LTD, either directly or by way of guaranty of suretyship, out of any of Trader’s funds or property in its custody or control or in the custody or control of any MBC FINANCIAL SERVICES LTD affiliate; (2) sell any or purchase any foreign exchange contracts, securities or other property held or carried for Trader; and (3) cancel any or all outstanding orders or contracts, or any other commitments made with Trader. Any of the above actions may be taken without demand for margin or additional margin, without prior notice of sale or purchase or other notice to Trader, Trader’s personal representatives, heirs, executors, administrators, trustees, legatees or assigns and regardless of whether the ownership interest shall be solely Trader’s or held jointly with others. In liquidation of Trader’s long or short positions, MBC FINANCIAL SERVICES LTD may, in its sole discretion, offset in the same settlement or it may initiate new long or short positions in order to establish a spread or straddle which in MBC FINANCIAL SERVICES LTD’s sole judgment may be advisable to protect or reduce existing positions in Trader’s account. Any sales or purchases hereunder may be made according to MBC FINANCIAL SERVICES LTD’s judgment and at its discretion. 6. CHARGES. Trader shall pay such brokerage, commission and special service and all other charges (including, without limitation, charges by Introducer authorized by Trader, markups and markdowns, statement charges, idle account charges, order cancellation charges, account transfer charges or other charges), fees (including but not limited to) charges by MBC FINANCIAL SERVICES LTD for providing services hereunder. MBC FINANCIAL SERVICES LTD may change its charges without notice. All such charges shall be paid by Trader as they are incurred, or as MBC FINANCIAL SERVICES LTD in its sole and absolute discretion may determine, and Trader hereby authorizes MBC FINANCIAL SERVICES LTD to withdraw the amount of any such charges from Trader’s account(s). Trader agrees to pay a transfer fee, to be designated by MBC FINANCIAL SERVICES LTD in the event Trader instructs MBC FINANCIAL SERVICES LTD to transfer open positions, monies, and/or property of Trader’s account to another institution. Spread Disclosure: Each transaction for Trader’s account includes a spread between the bid and the ask prices for any foreign exchange contract. The spread in the dealing rates is a cost imposed by MBC FINANCIAL SERVICES LTD on all trades for making foreign exchange contract transactions. The spread may increase or decrease based on the sole determination of MBC FINANCIAL SERVICES LTD. Trader should consider the spread because it can affect the profitability of Trader’s transactions or add to Trader’s losses. The spread may not be the same for each foreign currency offered by MBC FINANCIAL SERVICES LTD or for each strike price within the individual foreign currency. 7. STATEMENTS AND CONFIRMATION. Reports of the confirmation of orders and statements of accounts for Trader shall be deemed correct and shall be conclusive and binding upon Trader if not objected to immediately upon receipt and confirmed in writing within (1) day after transmittal to Trader by mail or otherwise. Margin calls shall be conclusive and binding unless objected to immediately in writing. Written objections on Trader’s part shall be directed to MBC FINANCIAL SERVICES LTD, Inc. at its home office located at: 20 Park Plaza Suite 1000 Boston Massachusetts 02116 or the most recent address as indicated on the MBC FINANCIAL SERVICES LTD website, and shall be deemed received only if actually delivered or mailed by registered mail, return receipt requested. Failure to object shall be deemed ratification of all actions taken by MBC FINANCIAL SERVICES LTD or MBC FINANCIAL SERVICES LTD’s agents prior to Trader’s receipt of said reports. Trader’s failure to receive a trade confirmation shall not relieve Trader of the obligation to object as set out herein. MBC FINANCIAL SERVICES LTD’s failure to issue a confirmation shall not prejudice or invalidate the terms of any foreign exchange contract transaction. 8. COMMUNICATIONS. Reports, statements, notices and any other communications may be transmitted to Trader via mail or via email at the address provided by the Trader on Trader’s application, or to such other address as Trader may from time to time designate in writing to MBC FINANCIAL SERVICES LTD. All communications so sent, whether by mail, telegraph, messenger or otherwise, shall be deemed transmitted by MBC FINANCIAL SERVICES LTD when deposited in the mail, or when received by a transmitting agent, and deemed delivered to Trader personally, whether actually received by Trader or not. 9. MBC FINANCIAL SERVICES LTDRESPONSIBILITIES. MBC FINANCIAL SERVICES LTD will not be responsible for delays in the transmission of orders due to a breakdown or failure of transmission or communication facilities, electrical power outage or for any other cause beyond MBC FINANCIAL SERVICES LTD’s control or anticipation. MBC FINANCIAL SERVICES LTD shall only be liable for its actions directly attributable to negligence, willful default or fraud on the part of MBC FINANCIAL SERVICES LTD. MBC FINANCIAL SERVICES LTD shall not be liable for losses arising from the default of any agent or any other party used by MBC FINANCIAL SERVICES LTD under this agreement. 10. CURRENCY FLUCTUATION RISK. If Trader directs MBC FINANCIAL SERVICES LTD to enter into any foreign exchange contract transaction: (a) any profit or loss arising as a result of a fluctuation in the exchange rate affecting such currency will be entirely for Trader’s account and risk; (b) all initial and subsequent deposits for margin purposes shall be made in U.S. dollars, in such amounts as MBC FINANCIAL SERVICES LTD may in its sole discretion require; and (c) MBC FINANCIAL SERVICES LTD is authorized to convert funds in Trader’s account for margin into and from such foreign currency at a rate of exchange determined by MBC FINANCIAL SERVICES LTD in its sole discretion on the basis of the then prevailing money market rates. 11. RISK ACKNOWLEDGMENT. Trader acknowledges that investments in leveraged foreign exchange contract transactions are speculative, involve a high degree of risk, and are appropriate only for persons who can assume risk of loss of their margin deposit or premium paid plus all charges including commission, costs and fees. Trader understands that because of the low margin normally required in trading foreign exchange contracts, price changes in foreign exchange contracts may result in the loss of Trader’s margin deposit or premium paid plus all charges including commission, costs and fees. Trader warrants that Trader is willing and able, financially and otherwise, to assume the risk of foreign exchange contracts trading, and in consideration of MBC FINANCIAL SERVICES LTD’s carrying his/her account(s), Trader agrees not to hold MBC FINANCIAL SERVICES LTD responsible for losses incurred through following its trading recommendations or suggestions or those of its employees, agents or representatives. Trader recognizes that guarantees of profit or freedom from loss are impossible to make in performance of foreign exchange contracts trading. Trader acknowledges that Trader has received no such guarantees from MBC FINANCIAL SERVICES LTD or from any of its representatives or any introducing agent or other entity with whom Trader is conducting his/her MBC FINANCIAL SERVICES LTD account and has not entered into this agreement in consideration of or in reliance upon any such guarantees or similar representations. MBC FINANCIAL SERVICES LTD assumes no liability for any representations made by introducer. MBC FINANCIAL SERVICES LTD and introducer are wholly separate and independent from one another. The agreement between MBC FINANCIAL SERVICES LTD and introducer does not establish a joint venture or partnership and introducer is not an agent or employee of MBC FINANCIAL SERVICES LTD. 12. TRADING RECOMMENDATIONS. (a) Trader acknowledges that (i) any market recommendations and information communicated to Trader by MBC FINANCIAL SERVICES LTD or by any person within the company, does not constitute an offer to sell or the solicitation of an offer to buy any foreign exchange contract, (ii) such recommendation and information, although based upon information obtained from sources believed by MBC FINANCIAL SERVICES LTD to be reliable, may be based solely on a broker’s opinion and that such information may be incomplete and may be unverified, (iii) MBC FINANCIAL SERVICES LTD makes no representation, warranty or guarantee as to, and shall not be responsible for, the accuracy or completeness of any information or trading recommendation furnished to Trader, and (iv) MBC FINANCIAL SERVICES LTD acts as counter party to all foreign exchange contract transactions and therefore MBC FINANCIAL SERVICES LTD may profit as a direct result of any market recommendation or information relied upon by Trader which does not prove profitable to Trader. Trader acknowledges that MBC FINANCIAL SERVICES LTD and/or its officers, directors, affiliates, associates, stockholders or representatives may have a position in or may intend to buy or sell currencies, which are the subject of market recommendations furnished to Trader, and that the market position of MBC FINANCIAL SERVICES LTD or any such officer, director, affiliate, associate, stockholder or representative may not be consistent with the recommendations furnished to Trader by MBC FINANCIAL SERVICES LTD. Trader acknowledges that MBC FINANCIAL SERVICES LTD makes no representations concerning the tax implications or treatment of foreign exchange contracts; and, (b) Trader further acknowledges that should Trader grant trading authority or control over Trader’s account to a third-party (.Trading Agent. ), whether on a discretionary or non-discretionary basis, MBC FINANCIAL SERVICES LTD shall in no way be responsible for reviewing Trader’s choice of such Trading Agent nor making any recommendations with respect thereto. Trader understands that MBC FINANCIAL SERVICES LTD makes no warranties nor representations concerning the Trading Agent, that MBC FINANCIAL SERVICES LTD shall not be responsible for any loss to Trader occasioned by the actions of the Trading Agent and that MBC FINANCIAL SERVICES LTD does not, by implication or otherwise, endorse or approve of the operating methods of the Trading Agent. If Trader gives Trading Agent authority to exercise any of its rights over Trader’s account(s), Trader understands that Trader does so at Trader’s own risk. MBC FINANCIAL SERVICES LTD assumes no liability for any representations made by introducer. MBC FINANCIAL SERVICES LTD and introducer are wholly separate and independent from one another. The agreement between MBC FINANCIAL SERVICES LTD and introducer does not establish a joint venture or partnership and introducer is not an agent or employee of MBC FINANCIAL SERVICES LTD 13. TRADER REPRESENTATIONS AND WARRANTIES. Trader represents and warrants that: (a) Trader is of sound mind, legal age and legal competence; and, (b) no person other than Trader has or will have an interest in Trader’s account(s); and, (c) Trader hereby warrants that regardless of any subsequent determination to the contrary, Trader is suitable to trade foreign exchange contracts, and, (d) Trader is not now an employee of any exchange, any corporation in which any exchange owns a majority of the capital stock, any member of any exchange and/or firm registered on any exchange, or any bank, trust, or insurance company, and in the event that Trader becomes so employed, Trader will promptly notify MBC FINANCIAL SERVICES LTD via e-mail of such employment; and, (e) all the information provided in the information portion of this booklet is true, correct and complete as of the date hereof and Trader will notify MBC FINANCIAL SERVICES LTD promptly of any changes in such information. 14. DISCLOSURE OF FINANCIAL INFORMATION. Trader represents and warrants that the financial information disclosed to MBC FINANCIAL SERVICES LTD in this document is an accurate representation of the Trader’s current financial condition. Trader represents and warrants that in determining Trader’s Net Worth, Assets and Liabilities, amounts were carefully calculated, then, Liabilities were subtracted from Assets to determine the value that Trader has included in the financial information as Net Worth. Trader represents and warrants that in determining the value of Assets, the Trader included cash and/or cash equivalents, U.S. Government and Marketable securities, real estate owned (excluding primary residence), the cash value of life insurance and other valuable Assets. Trader represents and warrants that in determining the value of Liabilities, Trader included notes payable to banks (secured and unsecured), notes payable to relatives, real estate mortgages payable (excluding primary residence) and other debts. Trader represents and warrants that in determining Trader’s Liquid Assets, Trader included only those Assets that can be quickly (within one day’s time) converted to Cash. Trader represents and warrants that Trader has very carefully considered the portion of Trader’s assets that Trader considers to be Risk Capital. Trader recognizes that Risk Capital is the amount of money Trader is willing to put at risk and if lost would not, in any way, change Trader’s lifestyle. Trader agrees to immediately inform MBC FINANCIAL SERVICES LTD if the Trader’s financial condition changes in such a way to reduce Trader’s Net Worth, Liquid Assets and/or Risk Capital. 15. NO GUARANTEES. Trader acknowledges that Trader has no separate agreement with Trader’s broker, Introducer or any MBC FINANCIAL SERVICES LTD employee or agent regarding the trading in Trader’s MBC FINANCIAL SERVICES LTD account, including any agreement to guarantee profits or limit losses in Trader’s account. Trader understands that Trader is under an obligation to notify MBC FINANCIAL SERVICES LTD’s Compliance Officer immediately in writing as to any agreement of this type. Further, Trader understands that any representations made by anyone concerning Trader’s account that differ from any statements Trader receives from MBC FINANCIAL SERVICES LTD must be brought to the attention of MBC FINANCIAL SERVICES LTD’s Compliance Officer immediately in writing. Trader understands that Trader must authorize every foreign exchange contract transaction prior to its execution unless Trader has delegated discretion to another party by signing MBC FINANCIAL SERVICES LTD’s limited trading authorization, and any disputed transactions must be brought to the attention of MBC FINANCIAL SERVICES LTD’s Compliance Officer pursuant to the notice requirements of this Trader Agreement. Trader agrees to indemnify and hold MBC FINANCIAL SERVICES LTD harmless from all damages or liability resulting from Trader’s failure to immediately notify MBC FINANCIAL SERVICES LTD’s Compliance Officer of any of the occurrences referred to herein. All notices required under this section shall be sent to MBC FINANCIAL SERVICES LTD at its home office. 16. CREDIT. Trader authorizes MBC FINANCIAL SERVICES LTD or agents acting on behalf of MBC FINANCIAL SERVICES LTD to investigate Trader’s credit standing and in connection therewith to contact such banks, financial institutions and credit agencies as MBC FINANCIAL SERVICES LTD shall deem appropriate to verify information regarding Trader. Trader further authorizes MBC FINANCIAL SERVICES LTD to investigate Trader’s current and past investment activity, and in connection therewith, to contact such futures commission merchants, exchanges, broker/dealers, banks, and compliance data centers as MBC FINANCIAL SERVICES LTD shall deem appropriate. Upon reasonable request made in writing by Trader to MBC FINANCIAL SERVICES LTD, Trader shall be allowed to review any records maintained by MBC FINANCIAL SERVICES LTD relating to Trader’s credit standing. Trader shall also be allowed, at Trader’s sole cost and expense, to copy such records. 17. NO WAIVER OR AMENDMENT. No provision of this Agreement may be waived or amended unless the waiver or amendment is in writing and signed by both Trader and an authorized officer of MBC FINANCIAL SERVICES LTD. No waiver or amendment of this Agreement may be implied from any course of dealing between the parties or from any failure by MBC FINANCIAL SERVICES LTD or its agents to assert its rights under this Agreement on any occasion or series of occasions. No oral agreements or instructions to the contrary shall be recognized or enforceable. This instrument and the attachments hereto embody the entire agreement of the parties, superseding any and all prior written and oral agreements and there are no other terms, conditions or obligations other than those contained herein. 18. GOVERNING LAW AND JURISDICTION. This Agreement, the rights and obligations of the parties hereto, and any judicial or administrative action or proceeding arising directly or indirectly hereunder or in connection with the transactions contemplated hereby, whether brought by Customer or by us, shall be governed by, construed and enforced in all respects by the laws of England and shall be held, at the sole discretion of MBCFX, within England, exclusively. Customer consents and submits to, and waives any objection that it may have to such venue, and further agrees to waive any right that it may have to transfer or change the venue or any such action or proceeding. Customer consents and submits to the jurisdiction of any appropriate court located within England in any action or proceeding arising directly or indirectly hereunder, whether brought by Customer or MBCFX. 19. SEVERABILITY. In the event any one or more of the provisions contained in the Agreement should be held invalid, illegal, or unenforceable in any respect, the validity, legality, and enforceability of the remaining provisions contained in the Agreement shall not in any way be affected or impaired thereby. The parties shall endeavor in good faith negotiations to replace the invalid, illegal, or unenforceable provisions with valid provisions the economic effect of which comes as close as possible to that of the invalid, illegal, or unenforceable provisions. 20. ASSIGNMENT. Trader may not assign, transfer or charge, or purport to assign, transfer or charge its rights or obligations under the Agreement to a third party without the prior written consent of MBC FINANCIAL SERVICES LTD Without the prior written consent of MBC FINANCIAL SERVICES LTD, any purported assignment, transfer, or charge by Trader shall be void. 21. BINDING EFFECT. This Agreement shall be continuous and shall cover, individually and collectively, all accounts of Trader at any time opened or reopened with MBC FINANCIAL SERVICES LTD irrespective of any change or changes at any time in the personnel of MBC FINANCIAL SERVICES LTD or its successors, assigns, or affiliates. This Agreement including all authorizations, shall inure to the benefit of MBC FINANCIAL SERVICES LTD and its successors and assigns, whether by merger, consolidation or otherwise, and shall be binding upon Trader and/or the estate, executor, trustees, administrators, legal representatives, successors and assigns of Trader. Trader hereby ratifies all transactions with MBC FINANCIAL SERVICES LTD affected prior to the date of this Agreement, and agrees that the rights and obligations of Trader in respect thereto shall be governed by the terms of this Agreement. 22. TERMINATION. This Agreement shall continue in effect until termination, and may be terminated by Trader at any time when Trader has no open position(s) and no liabilities held by or owed to MBC FINANCIAL SERVICES LTD upon the actual receipt by MBC FINANCIAL SERVICES LTD of written notice of termination via e-mail or via Mail return receipt requested, or at any time whatsoever by MBC FINANCIAL SERVICES LTD upon the transmittal of written notice of termination to Trader; provided, that such termination shall not affect any transactions previously entered into and shall not relieve either party of any obligations set out in this agreement nor shall it relieve Trader of any obligations arising out of prior transactions entered into in connection with this Agreement. 23. NO WAIVER. No indulgence or concession granted by MBC FINANCIAL SERVICES LTD an no omission or delay on the part of MBC FINANCIAL SERVICES LTD in exercising any right, power, or privilege under the Agreement shall operate as a waiver thereof, nor shall any single or partial exercise of any such right, power or privilege preclude any other or further exercise thereof or the exercise of any other right, power or privilege. 24. INDEMNIFICATION. Trader agrees to indemnify and hold MBC FINANCIAL SERVICES LTD, its affiliates, employees, agents, successors and assigns harmless from and against any and all liabilities, losses, damages, costs and expenses incurred by MBC FINANCIAL SERVICES LTD arising out of Trader’s failure to fully and timely perform Trader’s agreements herein or should any of the representations and warranties of Trader fail to be true and correct. Trader also agrees to pay promptly to MBC FINANCIAL SERVICES LTD all damages, costs and expenses incurred by MBC FINANCIAL SERVICES LTD in the enforcement of any of the provisions of this Agreement and any other agreements between MBC FINANCIAL SERVICES LTD and Trader. 25. TERMS AND HEADINGS. 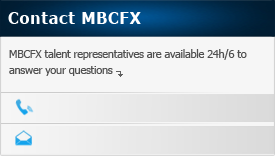 The term “MBCFX” shall be deemed to include MBC FINANCIAL SERVICES LTD, its divisions, its successors and assigns; the term “Trader” shall mean the party (or parties) executing the Agreement; and the term “Agreement” shall include all other agreements and authorizations executed by Trader in connection with the maintenance of Trader’s account with MBC FINANCIAL SERVICES LTD regardless of when executed. The paragraph headings in this Agreement are inserted for convenience of reference only and are not deemed to limit the applicability or affect the meaning of any of its provisions. 26. ACCEPTANCE. This Agreement shall not be deemed to be accepted by MBC FINANCIAL SERVICES LTD nor become a binding contract between Trader and MBC FINANCIAL SERVICES LTD until approved at MBC FINANCIAL SERVICES LTD home office and signed by its authorized representative(s). 27. RECORDINGS. Trader agrees and acknowledges that all conversations regarding Trader’s account(s) between Trader and MBC FINANCIAL SERVICES LTD personnel may be electronically recorded with or without the use of an automatic tone-warning device. Trader further agrees to the use of such recordings and transcripts thereof as evidence by either party in connection with any dispute or proceeding that may arise involving Trader or MBC FINANCIAL SERVICES LTD Trader understands that MBC FINANCIAL SERVICES LTD destroys such recordings at regular intervals in accordance with MBC FINANCIAL SERVICES LTD’s established business procedures and Trader hereby consents to such destruction. 28. TIME; TIME OF ESSENCE. The times referred to in the Agreement shall refer to the local time of the MBC FINANCIAL SERVICES LTD office. Time shall be of the essence in the Agreement. 29. PRIVACY ACT. This notice is provided for Trader’s records in accordance with the nonpublic personal information disclosure requirements. MBC FINANCIAL SERVICES LTD and its affiliates collect information that is personally identifiable financial information. The information collected is in the form of annual income, net worth, and banking account information. As policy MBC FINANCIAL SERVICES LTD collects this information for its own use. Information is not shared with any affiliated or non-affiliated entities, except when permitted by law. MBC FINANCIAL SERVICES LTD and its affiliates maintain physical electronic and procedural safeguards that comply with any Governmental Authority Standards to protect customer information. MBC FINANCIAL SERVICES LTD and its affiliates restrict access to the personal information of investors to those employees who need to know that information in the course of their job responsibility. 30. RULES AND REGULATIONS FOR TRADER ACCOUNTS I. MBC FINANCIAL SERVICES LTD establishes all rules and provisions for Trader accounts, including but not limited to minimum account size, investment time period, account charges or any other financial arrangements. MBC FINANCIAL SERVICES LTD may change, in its sole discretion, all rules and provisions for Trader accounts. Trader shall be required to comply with such rules and provisions at all times. II. It is the Trader’s responsibility to find out all necessary information about MBC FINANCIAL SERVICES LTD and make sure that all arrangements are discussed and clearly understood prior to any trading activity. III. It is the Trader’s responsibility to find out all necessary information about a Trading Agent prior to any trading activity, if the account is to be traded by someone other than Trader. IV. The automated MBC FINANCIAL SERVICES LTD trading system will distribute profits and losses accordingly to all Trader accounts. V. All Traders should be aware that no one can guarantee any return in a foreign currency account or against a loss of all Traders monies, deposits or margins. In addition, MBC FINANCIAL SERVICES LTD is not responsible for any claims or assurances made by Trader’s broker, Introducer, MBC FINANCIAL SERVICES LTD, its employees and/or associates or any other third party. VI. All Trader accounts will have their margin requirements established by the dealing desk at MBC FINANCIAL SERVICES LTD VII. Please make sure that the funds you are sending match the title of your new Foreign Exchange account. The name on the account that you are wiring funds from must be the same as listed on your account application. YOUR ACCOUNT CANNOT BE FUNDED BY THIRD PARTIES OR ENTITIES NOT SPECIFICALLY LISTED IN THE TITLE OF YOUR ACCOUNT. Mailing Address: MBC FINANCIAL SERVICES LTD, Ksour Bldg, 5th Floor Suite 3,Wouroud Ariana Avenue,Tunis 2037 Tunisia,Tel: 44-124-555-0400 . Please reference your name and account number on all checks, wire transfers, and correspondence. 31. LENDING AGREEMENT. By signing this Agreement, Trader authorizes MBC FINANCIAL SERVICES LTD and its affiliates to use all funds, securities, currencies and other property of Trader as specified in Paragraph 4 of the Trader Agreement. 32 AUTHORIZATION TO TRANSFER FUNDS Trader agrees hereby that MBC FINANCIAL SERVICES LTD may at any time, in the judgment of MBC FINANCIAL SERVICES LTD, its affiliates and its associates, apply and transfer from Trader’s currency account to any of Trader’s other accounts held with MBC FINANCIAL SERVICES LTD or other approved financial institution or its associates any of the monies, currencies, commodities, securities, or other property of Trader, held either individually or jointly with others to another regulated account of the same said Trader. 33. CONSENT TO ELECTRONIC TRANSMISSION OF ACCOUNT STATEMENTS Trader hereby consents to have Trader’s account information and trade confirmations available on the Internet in lieu of having such information delivered to Trader via mail or email. Trader will be able to access account information via the MBC FINANCIAL SERVICES LTD website using Trader’s account login information to access the account. MBC FINANCIAL SERVICES LTD will post all of Trader’s account activity and Trader will be able to generate daily, monthly and yearly reports of account activity as well as a report of each executed trade. Updated account information will be available no more than twenty-four hours after any activity takes place on Trader’s account. Posting of account information on Trader’s online account will be deemed delivery of confirmation and account statements. At all times, account information will include trade confirmations with ticket numbers, purchase and sale rates, used margin, amount available for margin trading, statements of profits and losses, as well as current open or pending positions. Trader may revoke this consent at any time upon written notice to MBC FINANCIAL SERVICES LTD 34. REFERRAL DISCLOSURE PLEASE BE ADVISED THAT MBC FINANCIAL SERVICES LTD, INC. AND REFERRING AGENT ARE WHOLLY SEPARATE AND INDEPENDENT FROM ONE ANOTHER AND THERE EXISTS NO JOINT VENTURE OR PARTNERSHIP RELATIONSHIP BETWEEN THE PARTIES. ADDITIONALLY, NEITHER REFERRING AGENT NOR ANY OTHER EMPLOYEE OR AGENT OF REFFERING AGENT IS AN AGENT OR EMPLOYEE OF MBC FINANCIAL SERVICES LTD. a. MBC FINANCIAL SERVICES LTD does not control, and cannot endorse or vouch for the accuracy or completeness of any information or advice Trader may have received or may receive in the future from Referring Agent or from any other person not employed by MBC FINANCIAL SERVICES LTD regarding Foreign Exchange trading or the risks involved in such trading. b. MBC FINANCIAL SERVICES LTD provides risk disclosure information to all new Traders when they open accounts. Trader should read that information carefully, and should not rely on any information to the contrary from any other source. If Trader is provided any information to the contrary by Introducer, Trader must notify MBC FINANCIAL SERVICES LTD immediately and not undertake and foreign exchange contract transactions. c. Trader acknowledges that no promises have been made by MBC FINANCIAL SERVICES LTD, the Introducer or any individual associated with MBC FINANCIAL SERVICES LTD or the Introducer regarding future profits or losses in Trader’s account. Trader understands that Foreign Exchange trading is very risky, and that many people lose money trading. d. If Referring Agent or any other third party provides Trader with information or advice regarding Foreign Exchange trading, MBC FINANCIAL SERVICES LTD shall in no way be responsible for any loss to Trader resulting from Trader’s use of such information or advice. e. To the extent Trader has previously been led to believe or believes that utilizing any third party trading system, course, program, research or recommendations provided by Referring Agent or any other third party will result in trading profits, Trader hereby acknowledges, agrees and understands that all Foreign Exchange trading, including trading done pursuant to a system, course, program, research or recommendations of Referring Agent or another third party involves a substantial risk of loss. In addition, Trader hereby acknowledges, agrees and understands that the use of a trading system, course, program, research or recommendations of Referring Agent or another third party will not necessarily result in profits, avoid losses or limit losses. f. Because the risk factor is high in foreign currency transactions trading, only genuine “risk” funds should be used in such trading. If Trader does not have the extra capital the Trader can afford to lose, Trader should not trade in the foreign currency markets. g. Trader understands and acknowledges that MBC FINANCIAL SERVICES LTD may compensate Referring Agent for introducing Trader to MBC FINANCIAL SERVICES LTD and that such compensation may be on a per-trade basis or other basis. Such compensation to the Referring Agent may require the Trader to incur a mark-up, above and beyond the ordinary spread generally provided by MBC FINANCIAL SERVICES LTD. Further, the Trader has a right to be informed of the precise nature of such remuneration. h. Trader understands and agrees that if Trader’s account with MBC FINANCIAL SERVICES LTD is introduced by Referring Agent that Referring Agent shall have the right to access Trader’s MBC FINANCIAL SERVICES LTD account, but the Referring Agent shall not have the right to enter into any trades on Trader’s MBC FINANCIAL SERVICES LTD account unless authorized by Trader under a power of attorney between Trader and Referring Agent granting such Referring Agent the right to trade on Trader’s account. MBC FINANCIAL SERVICES LTD does not recommend or endorse Trader providing Power of Attorney to Introducer. Trader acknowledges that this is a legally binding contractual agreement. Trader has read it carefully, and by signing, Trader agrees to be bound by every term and condition, including the items listed above (1-34). 8 No modification of this Agreement is valid unless accepted by MBC FINANCIAL SERVICES LTD in writing. Trader confirms that Trader has downloaded a full set of account documents from MBC FINANCIAL SERVICES LTD’s website and Trader has not made any alterations or deletions to this agreement or any such documents from the original forms posted on the website. In the event that there are any alterations or deletions to this agreement or any such documents such alteration and deletions shall not be binding on MBC FINANCIAL SERVICES LTD and said original forms shall govern Trader’s account relationship with MBC FINANCIAL SERVICES LTD Should Trader have any questions regarding the risks of trading in foreign currency, please contact Trader’s account representative.